The Israelites are instructed further in preparations for the Tabernacle. Oil for the menorah, Priests clothing, priests consecration, and the incense table. The oil for the menorah is interestingly commanded to all Israelites to bring pure olive oil. So why olive oil? Olives are a worldwide symbol of peace. Olives take a long time to grow, and only in peaceful times can olives be effectively grown and harvested. The ner tamid (eternal light) in the synagogue above the ark is a reminder of the continual light of the menorah before the Holy of Holies. 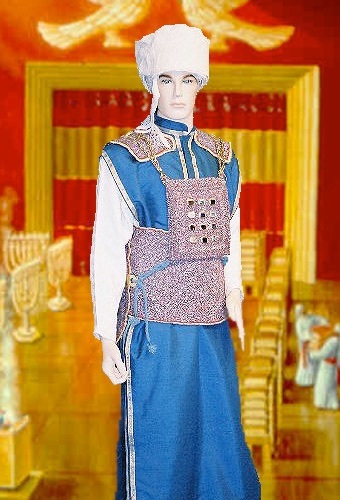 INTO the Tabernacle, or any “house of G~d,” they would far surpass the ornamentation we produce with all our skills. Since this is not possible, we are instructed to make a beautiful and ornate place where man can experience a wispy, gently touch from G~d. Where the symbols represent something ethereal about our Creator. We can not do more than that. And for the adventurous and mystical among us, G~d invites us to meet in the rest of the Creation; on mountain tops, in a coral reef, through a microscope, and in a loving embrace. G~d is not limited, nor is he lost. We, mankind, just rarely take the time to visit. This picture is very interesting as the priests have no beards. Bible Translation – Fact or Fantasy?